DogsBite.org is a public education website about dangerous dog breeds, chiefly pit bulls. We are the primary 501(c)(3) nonprofit organization dedicated to putting the safety of humans before dogs and the principal source of information on this topic that is not owned, controlled, or funded by dog breeders, dog advocacy, veterinarian or animal welfare groups. We do not receive government or corporate funding; we rely on donations from the public and our supporters -- people like you. Our compassion for dog mauling victims and communities, our courage to stand up to multi-million dollar animal organizations in the battle to save human lives and our outrage that barbaric maulings on public streets and within residential front yards by recognized dangerous dog breeds continue to be tolerated by policymakers, including the CDC, is what defines us. The CDC abandoned this issue in 1998. Hundreds of fatalities inflicted by pit bulls have occurred since. "We champion the rights of victims through our research, education and advocacy." DogsBite.org is a research and education nonprofit organization dedicated to conducting research on the growing, but underreported, public safety issue of severe and fatal dog attacks inflicted by well-documented dangerous dog breeds. We educate the public, law enforcement, journalists, attorneys and policymakers on the results of our research to prevent new life-altering attacks and to improve local, state and national policies to help protect the health and safety of human beings. DogsBite.org advocates on behalf of dog mauling victims and their families to advance preventative policies through amicus brief filings and by providing written testimony and high quality research analysis at city, county and state-level legislative hearings. We also advocate by sharing state-of-the art knowledge and best practices we've documented in other jurisdictions with other advocates, organizations or initiatives that operate under a similar mission as our own. Dog breeders, dog owners, veterinarian and animal welfare organizations have lobbyists in all 50 states. Victims of serious and fatal dog maulings, families and friends, health and public safety officials and the concerned public need advocates too. We advocate for you. DogsBite.org is also the primary whistleblower combating well-funded animal “expert” groups that manipulate the truth about dangerous dog breeds, primarily pit bulls. As maulings, maimings and deaths inflicted by a distinct group of dog breeds continues to accelerate3 and more communities seek solutions, DogsBite.org is needed now more than ever. We are the public's countervailing force to these well-funded animal groups that have no mission or duty to protect human lives. Breed-specific legislation regarding pit bulls should always have the inclusion of mandatory micro-chipping and liability insurance, we recommend $300,000 at minimum. If a dog is unidentifiable, its owner cannot be identified for civil or criminal recourse. If an owner holds insufficient levels of liability insurance, the victim’s medical bills, loss of income and rehabilitation expenses cannot be recovered. Pit bulls were selectively bred for an activity that is now a felony in all 50 states: dogfighting. Pit bulls are the "chosen" breed for drug dealers, gang members and other violent offenders and as such, make up the vast majority of dogs shot by police officers.7 Convicted felons do not have the right to own a firearm, nor should they have a right to own a dog breed easily deployed as a "deadly weapon." Many small municipalities struggle in responding to the sudden loss of an innocent life or a horrific mauling inflicted by a pit bull. Families of victims, emergency first responders, medical professionals, law enforcement agencies and elected local, county and state officials seek reliable sources of information and model drafts of legislation that will provide answers and viable solutions to prevent further tragedies. DogsBite.org strives to be the most reliable source for this information. Municipalities that have taken action to protect their citizens are often harassed by a flood of well-organized, artificially created telephone calls, letters, and emails by aggressive "breed activists" located in outside jurisdictions.8 These municipalities are also threatened with lawsuits by pit bull owners, breeders and animal groups. However, well-written pit bull ordinances enjoy a 100% success rate in litigation. DogsBite.org strives to facilitate communication between small jurisdictions and the leading legal experts in the nation, so the leading scientific evidence and the winning legal research and writing can be easily obtained. Colleen Lynn resides in Austin, Texas and operates Lynn Media Group. On June 17th, 2007, she was attacked for approximately 5-seconds by a leashed pit bull while jogging in her former Seattle neighborhood. She was hospitalized for two days at Harborview Medical Center after undergoing surgery to repair a severe bone fracture. Four months later, she launched DogsBite.org. 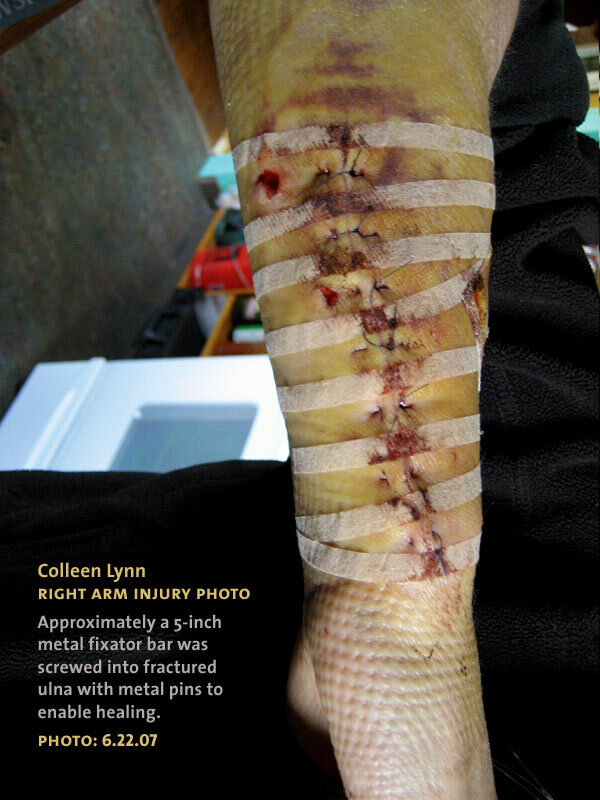 Learn more about Colleen Lynn by reading her four-year anniversary blog post about her attack. In April 2014, the Maryland legislature abrogated the landmark appellate decision, Tracey v. Solesky. Lawyers and judges across the United States, however, will still be able to refer to the decision as the seminal case declaring pit bulls "inherently dangerous" for years to come. As demonstrated on the annually updated DogsBite.org spreadsheet, Estimated U.S. Cities, Counties, States and Military Facilities with Breed-Specific Pit Bull Laws, breed-specific legislation exists in at least 50 different countries. In 39 of these countries, including the United Kingdom, France and Denmark, these laws have been adopted on a national level. The 35-Year Summary of Pit Bull Trends, by Merritt Clifton, editor Animals 24-7, shows the alarming escalation of mauling and maiming injuries inflicted by pit bulls since 2007. The summary is a subset of the larger report by Clifton, Dog Attack Deaths and Maimings, U.S. & Canada, September 1982 to December 31, 2017. There may be no better example than Denver City Council Members who have a history of being flooded with emails from out-of-state activists seeking to remove the city's pit bull ban. The problem was so bad in 2009 (chiefly organized by California-based, DenverKillsDog.com), council members had to screen the avalanche of "spam" from real messages from their own constituents. One screening method used was to ignore all emails that failed to state the jurisdiction in the subject line.